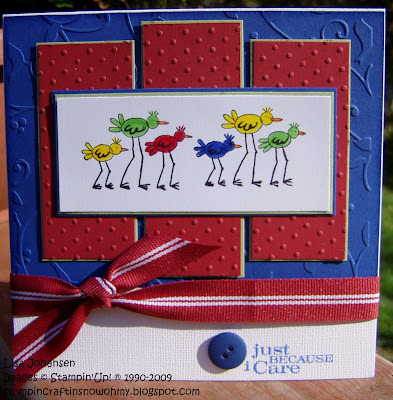 Last week over at Inka Dinka Doodle Holly posted the last letter in her Sunday Stamps challenge, which would be 'Z'. It wasnt hard to pick a set, as the only one I have that begins with 'Z' is the SU set Zoofari. I thought it was such a darling set, had to have it and then couldnt figure out what to do with it after I got it.Dont you just love that? Anyway, I decided to use this weeks sketch challenge from Mojo Monday to go along with Holly's challenge. Here is my card. These little guys look like they'd be full of energy so I wanted to use some bright colors on this card.